"Growing Annuals - Come Grow with Us"
Mary & Larry Levsen of Sherwood Greenhouses. Note: There are 98 slides in this presentation. If you choose PLAY, it will change slides every 7 seconds, so it will take you 11.5 minutes to watch this presentation. A presentation from Dr. Rob Wright about tomatoes, detailing the history, varieties and care of tomatoes. Despite claiming to only be passionate about tomatoes and not a real expert, Rob's presentation contains a wealth of information. Sad to see Summer go all too quickly, falling out of love with Fall? 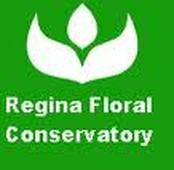 Ready to see the beauty of flowers and greens again, then please join us as we take a tour of the Regina Floral Conservatory. Rides are available, the cost for non member is $20 Members still FREE. Limited Space, so Please RSVP to ensure space. 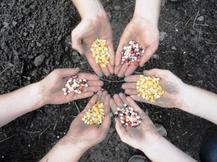 Jim Ternier will come out and explain the art of saving seeds. Ever grown the perfect peas, tomatoes, flower and want to have the same results next year, Jim will help us with the science of saving seeds that will grow next year. June 11th, 2014 Duane Haave will be coming out to discuss what we can do for water conservation and how we can make it work for our gardens. May 14th, 2014 Pat Kish a local greenhouse operator will be taking some time out of her busy schedule to come show us some of her tricks to making those fabulous container gardens we all love to see. 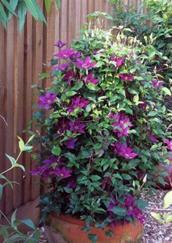 April 9th Doug Bradford will be coming out to share his knowledge about growing Clematis in our region. Please join us on March 12th, 2014 as we welcome Barrie Scherle the owner / operator of All in One Landscape Services Inc in Regina and learn from his experience of what to do and what not to do when considering hardscapes (decks, paths, fences, pavings, walls fountains and lighting etc). 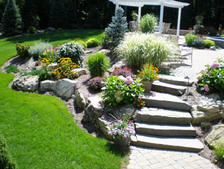 Hardscapes provide permanent definition and help establish a "style" to your outdoor environment. Come join us on Wednesday January 8th for our first meeting of 2014 where Joanne will give us some pointers to spruce up our interior decor with houseplants. 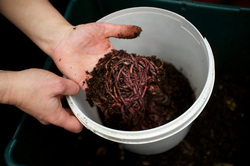 Come out on Oct 9th at 7 pm to the Ambassadors for Christ Church in Garden of Eden subdivision and learn how you can get a few worms to work all winter for you, devouring your table scraps with vermiculture. A great way to continue composting once the weather turns too cold to walk out to your composter in the garden. Free for members, guests and visitors $5 each. Don't forget your loonies for the door prize. On May 8th Dean Kreutzer from Over the Hill Orchard in Lumsden came in to talk to us about Organic Gardening. 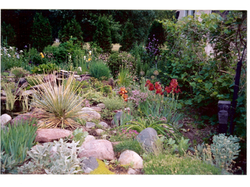 On April 10th Sara Williams, a well known Horticulture author came to talk to us about Xeriscaping. On March 13th Lynden Penner of the U of S Horticulture Department and CBC Garden Line came and gave a presentation on Colour in the Garden. On February 13th Jim Doolittle of Sask Peony Society came and shared his knowledge on Peonies, new and old and from where they originated. We were shown some VERY beautiful flowers from local and from his trips to see peony gardens. As well, we all received a special Valentines treat, Dean Kreutzer from Over the Hill Orchard in Lumsden donated some of their chocolate covered cherries. We are all looking forward to his presentation in May! Thank you Jim and Dean for making this such an entertaining evening. 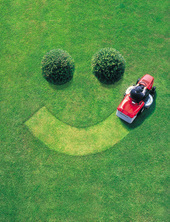 DEFINITIONS: An annual is a plant that completes its life cycle in one year or growing season eg. petunia. Some annuals seed themselves readily and come back again year after year, but they shouldn’t be confused with perennials that come from the root. A biennial takes 2 years to complete its life cycle (eg. Forget me not). Herbaceous Perennials have soft green stems as opposed to the brown woody stems of perennial shrubs. The tops die back each fall in our climate. Perennials may live many years and come again from the root each year (eg. 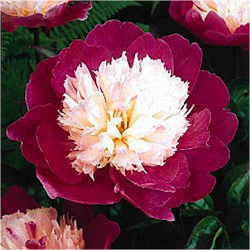 Peony). 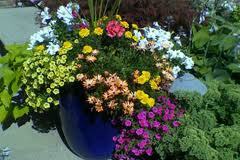 Some plants are perennial in warmer climates and we treat them as annuals here. Misconception: Some people believe that perennials are much easier because you don’t have to plant them each year. Unfortunately that’s untrue. They take equal effort – just different challenges. Design: May choose to repeat colours and forms and textures for continuity and connection to other areas of the yard. The garden evolves from year to year – never the same twice. Be patient. 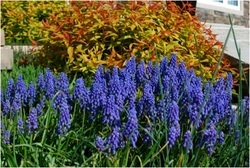 Perennials tend to have more informal style. Light requirements: Full sun (at least 6 hours), part sun, shade. Most plants will flower more with more sun. Bloom time: 2 weeks May, June, July, August, Sept. Ideally want something in bloom in all areas at all times – no bare spots, every year is different. 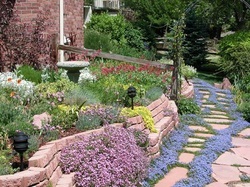 May include annuals in the perennial border for consistent bloom all summer. As a general rule: First year they sleep, Second year they creep, Third year they LEAP. Dividing: Spring bloomers divide in fall. Late bloomers divide in spring. Share with friends or hold a plant sale every few years. Foliage habit: stays green or dies back after bloom eg oriental poppy and bleeding heart – can grow something in front to screen die-back. Upkeep: staking, deadheading, weeding/cultivating, dividing and winter protection. Hardiness - Other factors: Snow cover, wind, heat exposure, water, mulch, microclimates. Garden Club Plant Sale this spring. 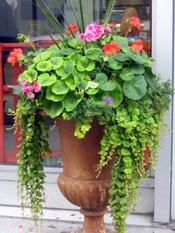 If you have 5”-6” pots you’d like to get rid of, call me at 781-2140 or drop them off at 34 Hummingbird Bay. Much appreciated. Water Gardens...All you need to know! 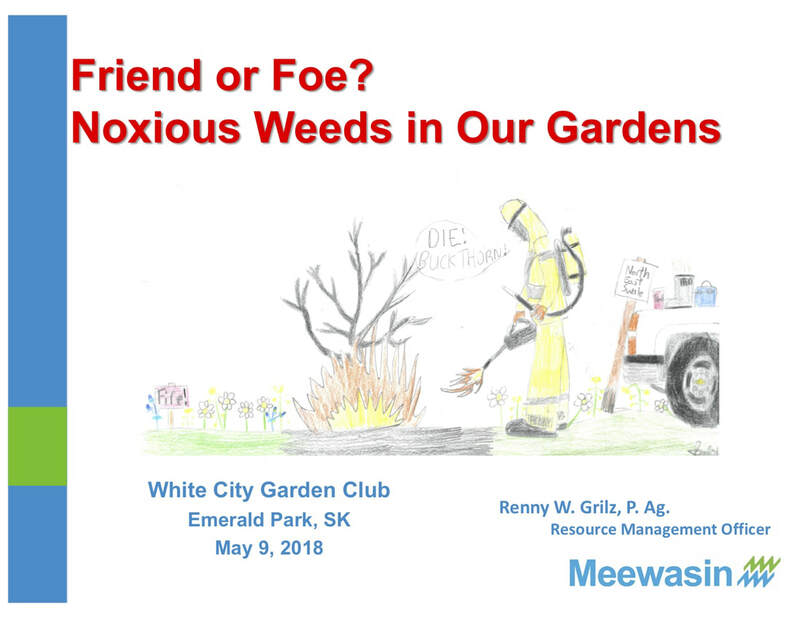 On June 12th we were lucky to have a wonderful presentation from D'Arcy Schenk of the Wascana Authority. From design concept to plants and their care, Darcy was able to provide us with some wonderful ideas and information for our water garden care. May 8, 2012 Gwendolyn Bokamyer of Custom Potters Greenhouses Inc in Regina came talk to us about container gardening. This presentation was at the Community Centre at 7pm. Gwendolyn gave us a lot to think about for container gardening and how to achieve the look you want without waiting all summer for the plants to mature! Gwendolyn also very generously donated the door prizes of several succulents and a beautiful basket for our raffle. April's presentation at the Town of White City Office on April 11, 2012 was VERY well attended. We would like to thank Bernie Zaharik for the very informative session on characteristics of Dahlias and their growing and storage needs. 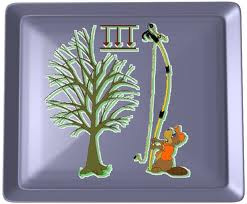 By: Natalie Randall, ISA certified Arborist, Natural Choice Tree Services. Black knot infects members of the Prunus family such as Schubert Chokecherry, Pin Cherry, Mayday and Chokecherry, Plum and Apricot. The disease takes two seasons to be apparent in an infected tree. The signs to watch out for are swelling in scaffold branches. 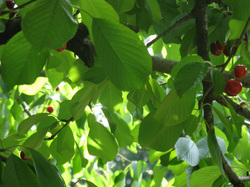 The branches will appear swollen looking as compared to surrounding branches that are unaffected. In the second season the infected branches will turn an olive green and become enlarged with striations. The spores will become active after spring rain and warm temperatures. The black fruiting bodies will then appear later in that season and will slowly encircle the branches. The black, gall looking growths are commonly known as poop on a stick. Black knot is a fungus that spreads by spores to surrounding trees and branches within an infected tree, by wind, insect, bird or by pruning tools. The most effective way to control the fungus is to check your plant for disease in the dormant season on a yearly basis. If caught early, the disease has a better chance of being controlled. Prune out limbs to smaller branches that are at least 4-6 inches below the Black Knot growths. Disinfect your tools in between cuts with a 1/50 bleach solution or another disinfectant. Prune in the dormant season when the disease is inactive and before bud break. Dispose of any diseased branches to the landfill. Unfortunately, diseased trees if left untreated, will continue to affect surrounding yards and parks. The disease is very aggressive and can eventually kill the infected tree. It will enter the main limbs and trunk, cutting off water and nutrient uptake to everything growing above the Black Knot growths. Consider planting other trees if there is a significant outbreak in your neighbourhood. Black Knot Fungus, Arborcare Tree Service Ltd., Calgary, Ab. Kay Luttmer presented on successfully growing and preserving tomatoes in our zone. -Always water from the bottom, this encourages roots to grow downwards. 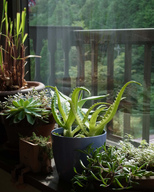 -Staking plants – instead of using cages (which make it difficult to prune) Kay suggests that you use something sturdier such as re-bar (4’ lengths works well). The steaks need to be at least 10” into the ground to provide support and the tomato plants should be supported by soft ties such as nylons. When watering, always water from the bottom where possible, watering with “manure tea” made with either manure or compost will help your tomatoes grow. Kay uses one small container of Miracle grow for the entire summer on her tomatoes & peppers. If you have old seeds and want to see how well they will germinate (or new seeds), start 10 seeds on a piece of damp paper towel placed in a ziplock bag….put it out of the way and check in one week, if only one seed germinated, you may not want to plant the seeds, if 8-10 germinated, the seeds are still good. If you want to collect your own seeds for next year Kay recommends you look online for how to and store them in a brown paper bag once dry with the info as to what they are.